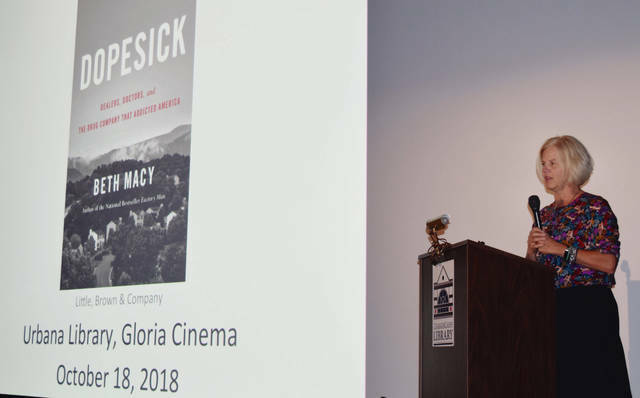 Best-selling author Beth Macy discusses her latest book, “Dopesick,” at the Gloria Theatre in Urbana on Thursday. The book details the opioid problem among families in rural and suburban areas of the eastern United States. Macy is a native of Urbana. Regional court and law enforcement officials, community leaders battling drug and alcohol abuse and fans of the author were in attendance at the event, which was followed by a book signing in the theatre lobby. Commercial and community sponsors made the event possible.